Yesterday we´ve booked a 3 day trip you can only do as a guided tour. We were only three so it would have become very expensive. But we decided that it is worth it and so we booked the tour. This morning we exidently talked to a Polish couple that arrived during the night and they decided to join our group. Right after a few minutes we knew that it was the right decision. Our tour guides are two young women from Kalaw. Thidar and Momo are super and Thidar is speaking a very good English as well. So we started our tour in direction Inle Lake. We passed a bunch of water buffalos right into the nature reservoir „Evergreen Forest“ with a lake placed in the center of the reservoir witch is also the drinking water of Kalaw. We made our lunch break on top of a hill were a restaurant called View Point Restaurant has its place. 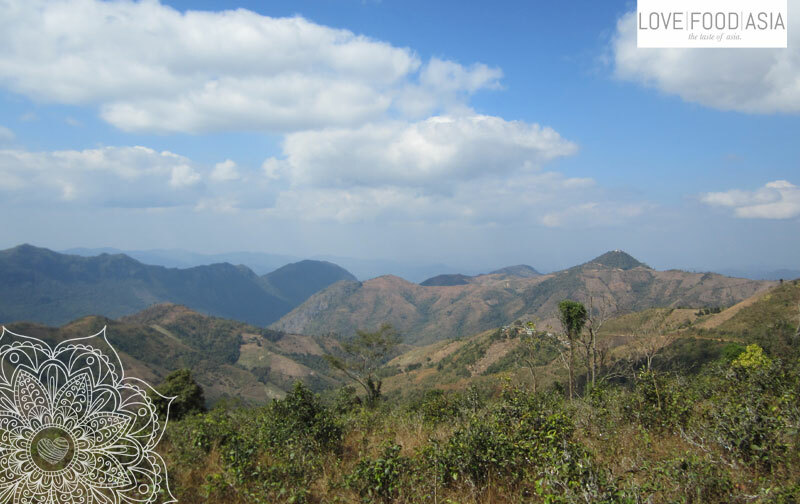 As the name is telling us we had a great view around the landscape of Kalaw. Our planet is a small place because I met a girl in the restaurant I´ve met in the Home Bar of Koh Lipe a view days ago. 2000 km away from here. Right after the break we hiked through the beautiful landscape with lots of bamboo, pine trees and lots of unknown plants. We passed a school in a small village called Hin Khar Kine were the boys and girls came out and had a look at our small group. Within a few minutes 3-5 children took my arms and had a look at my tattooed arms. The kids were part of the Palaung ethnic group and it seems like they haven´t seen tattooed arms like mine before. A wonderful experience. We came down to a railway where we walked along the rails until we reached our destination for today. We will sleep in a small house that belongs to Thidars grandmother. In the ground floor is a small open fire where the the granny is preparing our dinner for today. Our beds are in the first floor where we have to sleep on the floor with lots of blankets. We´re expecting a cold night so it´s good to have many blankets. There is also no tab water in the house and we have to wash on the outside. A basic and absolute great experience. The family cooked a super delicious meal with many veggies and tea for all of us before we lay our heavy bones down to sleep.